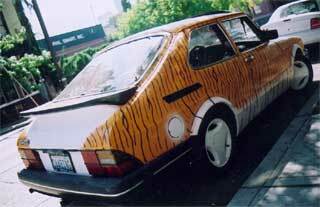 When I bought my Saab 900 S a few years ago, I knew I wanted to paint it. I originally envisioned a classic two-tone orange and brown. Later I considered various murals. It took me two years to decide on tiger, and then another six months to get started. I borrowed a friend's compressor and air gun, bought some One Shot sign painter's enamel, and parked in the lot of the art space I was co-managing. The job took about three days, during which I was fortunate to have no rain. 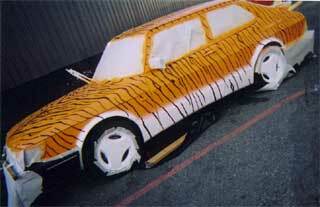 This was the first time I had painted a car, and I must admit I was somewhat frightened to start with. Though I'd been contemplated it for years, actually painting my car was akin to summonging the courage to step off a high bridge. Even after I spent the first day masking off the bits I didn't want painted, it still didn't seem real until I sanded off the first spots of rust. That first quarter-sized patch of steel gleaming in the sun sure seemed real enough. Once committed, the rest was much easier. 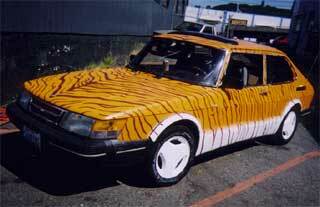 When I drove away in my new paint job three days later, I was very self-conscious. I felt that everyone must be staring, and I was disappointed if they weren't. It took a few weeks to get over that. Nowadays I mostly take it for granted, but it still makes me happy. I enjoy the freedom of self-expression, and can't imagine living without it. I know I'll never drive an undecorated car again. Step 1: Acquire a car. Step 2: Tape the non-painty bits. 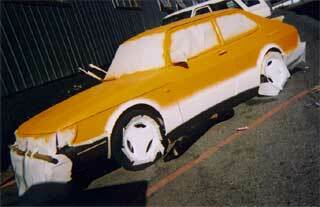 Step 3: Spray on the orange and white. Mmm...creamsicle! Step 4: Brush on the stripes. 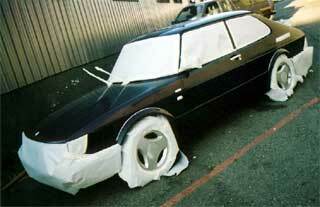 Step 5: Remove the tape. Look! A tiger! 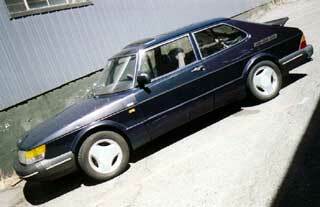 Note the sporty tail end.